Ronald Lee Mills went home to be with Lord on March 19, 2019 two days before his 64th birthday. He fought a good fight with his long time failing health. The fight was too tough and his body surrendered. Ron was born on March 21,1955 to William S. Mills Sr. and Mary Elizabeth Washington Mills in High Point. 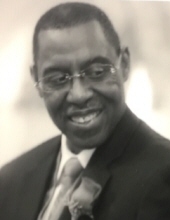 He attended First Emmanuel Missionary Baptist Church in High Point, under the leadership of D.D. Mason. Ron played in his high school band where he was a drum major and trombone player. He enjoyed traveling to different cities and performing in parades with the T. Wingate Andrews High School band. He graduated in 1973 and joined the US Marine Corp the same year and served for 4 years. He then joined the US Army and served for 4 years. Ron ended his army service at Fort Carson, Colorado in 1987. Colorado became his home after serving in the Army because he'd fallen in love with the Mountains and the spectacular sites Colorado offered. Ron was a member of The House of Prayer Holy Reformation Church under the leadership of Pastor Michael and Elmer Harp in Colorado Springs for many years. Ron employed with Apple and Intel for many years. After Intel relocated to another state, he obtained two Associate Degrees. He then found employment working for a private contracting company, T&H Services. He worked there for many years with true dedication until 3 weeks prior to death. Ron was a dedicated hard working man. His mantra was, " I have to get it done". He was a man of courage, strength, integrity and a true and faithful friend. Ron loved bowling and traveling. The highlight of his summer was to attend the Winter Park Jazz Festival in Winter Park, Colorado. He had not missed a year of attendance since 2003. Ron had a passion for gardening, and loved going to the garden centers to pick out just the right annual flowers to plant alongside his perennials. He would sit on the front porch and wait for compliments from the neighbors as they passed by. Ron was preceded in death by his mother; paternal grandparents, Charlie and Gracie Mills; and maternal grandparents, Rev Edward and Lydia Washington. Left to cherish precious memories include his loving wife, Gwendolyn Mills; father, William S. Mills Sr.; special aunt, Neecy Ann Mills; brother, William S. Mills Jr. (Carol); step daughter, Jacquelyn Estrada (Alberto); step granddaughter, Salina Estrada; niece Erica Mills and nephew Endris Mills; several aunts, uncles, cousins, and very special close friends, Jean, Monique, Dana, Marcus and Daniel Davis. A Service of Love will be given on Saturday, March 30, 2019 at First Emmanuel Baptist Church, 833 Leonard Avenue, High Point, NC. The family will receive visitors and friends from 12 to 1pm at the church on Saturday. The service will start at 1pm. Burial will follow at Floral Gardens Memorial Park with military honors.